Something I appreciate about this comic is characters being unafraid to call each other out on not-okay behaviour. It adds a sense of realism and averts ‘protagonist-centred morality’. Just cuz she can swim doesn’t make pushing her in not rude. Like dude. XD You’re an adult. Also I wouldn’t blame her for not going into a pool. Chemicals or no there’s bound to be gross junk in it. Do you have any idea how much “gross junk” is in our rivers and lakes? Especially the Great lakes? Public pools OTOH have huge filtration systems that run 24/7 so that every gallon of passes through several times a day. Dude there’s a difference between the lakes and rivers. DX And one is that you generally ain’t there if something pees in it. Also public pools are just bleh. Hurray to the lifeguard making sure that that behavior doesn’t go un-scolded. And I actually hope Selkie doesn’t poison him, just pulls him in. Given Selkie being playful here, it looks like she was more startled and indignant than actually upset, which is good. Ooo, Agent Brown, headed for the bottom. Never swim with the mermaids, folks. Didn’t Wendy have to learn that lesson in the Peter Pan play? Aaargh! Tiny periwinkle Trident missile! Someone forgot that Sarnothi are aquatic apex predators. CAN SOMEONE PLEASE GO 76??? At least she’s not a Hanzo main….. I guess that question would follow where do the Vast majority of the Sarnothi live? I mean I imagine they could be Hyperpredators in Lake Superior as I don’t think there are many large aquatic Predators in that specific body of water but I’m assuming there’s Sarnothi Cities and such out in the Ocean- where there are predators that can take out a human-sized animal- Sharks, Large Whales, Etc. Plus I think it’s a stretch to call a Sapient Lifeform a Hyperpredator- Surely the Sarnothi have sustainable.. well not farming but maybe Ranching? Keep a pen of fishies for noms during bad times? I dunno Your question kind of tickled my Sci-fi Worldbuilding brain so I decided to have a go at it. Sarnoth is located inside Lake Superior. They’re freshwater people, and don’t have a sister-city in the ocean. They’re definitely the alpha predator of Lake Superior. If the weren’t sentient (and thus able to form ranches and farms) they would have probably never grown as populous as they are due to food limitatons. Interesting! And my sci-fi worldbuilding brain works overtime too, I have around a dozen original alien species, a couple whom are aquatic! Sarnothi would probably count as hyper-predators technically, but they primarily feed their populace through eel and trout ranching instead of straight-up hunting. The most interesting thing about seahorses is that if you keep them in a marine aquarium you have to keep them in a tank without any other kind of fish or they will starve to death. You see, because they aren’t shaped like a torpedo, they swim, very, very slowly and by the time they get to the fish flakes the other fish have eaten it all. Which means you would only ride on a seahorse if you didn’t want to get there at all. Well, Posideon was supposed to have rode seahorses, and DC already pulls from Greek mythology (Wonder Woman’s background) so it makes sense that Aquaman has stolen/inherited Posideon’s magic seahorses I guess? Is it wrong that I’m humming the music from “Jaws” ??? I’m willing to be Selkie probably was too. This one don’t make a lot of sense. Lifeguard, apparently, does not know what Selkie is. If he did, I see no reason for him to get upset about pushing her in. Be like pushing a human kid outside. “I don’t want to go outside. Wanna play X-Box!” Don’t care. Sunshine, freash air, OUTSIDE!! And the “Oh GOD, she’s on the bottom!” Where else should she be? So he doesn’t know. Agent Orange’s “help her get over her fears” statement fits right in with “jerks throwing kids that can’t swim in, so they learn”. The “she’s a strong swimmer” doesn’t mesh with “get over her fears”, UNLESS he already knows. And a lifeguard who doesn’t know about her, seeing her pushed in and “she’s on the bottom!”, shoulda gone in after her. Even experienced emergency responders can freeze, even if momentarily, in an emergency. 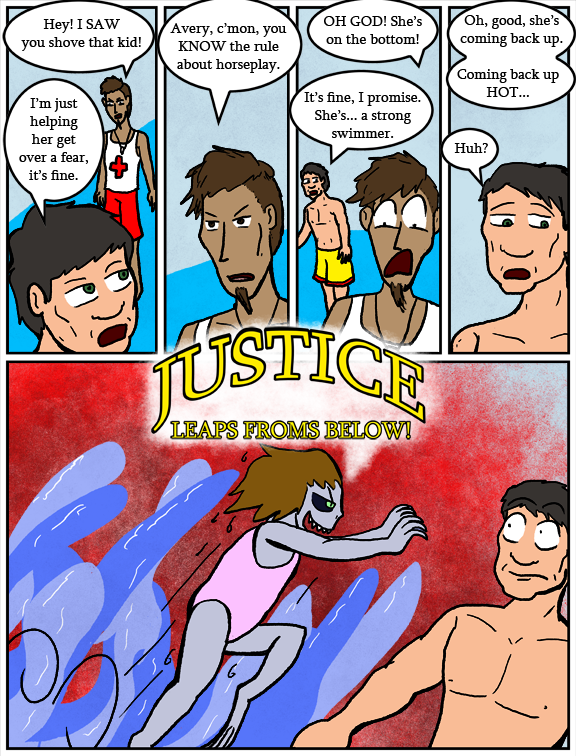 This is more likely if the lifeguard is new on the job. The scenario in which the lifeguard not jumping in to save Selkie instantly is plausible. If said lifeguard was in the know, getting riled because agent Brown pushed Selkie in the pool is still bad procedure, because there are other dangers besides drowning, such as head injuries caused by an uncontrolled fall. Perhaps LG was worried about the latter when he saw Selkie on the bottom. If the lifeguard is not in the know, (“My wife and kid have a genetic skin disease.”) then everything fits. Of course we must not leave out the possibility that LG is sort of in the know, but under orders not to ask questions and that everything he sees while on the job must stay on the job. they’re not at a government facility so the lifeguard is a civilian. it’s not reasonable for him to have any information other than he witnessed a child being shoved into the water by an adult. Oh the lifeguard is moving fast alright. Panel one he was way behind Avery, by panel three his is way in front of him. 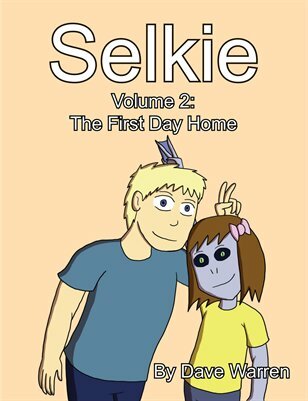 He is headed straight to the place Selkie went down – which is why he sees her coming up before Avery does. I suspect his sideways slant to the right was caused by the fact he was running, but we are so close to him we don’t see his legs and arms moving. As a Bastion main, can confirm this to be what I usually hear. Beep-boop, nuke the Pharah. I have got to get that game. Does the Origins version ever go on sale? I can’t see dropping $60 on a game I can only play every once in a while. I don’t know if it goes on sale at all honestly. I got the Standard version for $40. The only difference is a few less skins and stuff that’s only useable in other games. At least Agent Brown is wearing swim trunks … imagine if he were still in his dark suit, tie, and sunglasses? Personally, I like this as a better reference.